If you have enabled the add to queue by default, all newly uploaded media will be held in moderation and a report will be created by the system. 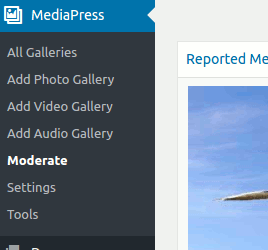 To see all the reports and the media in the moderation queue, you can visit Dashboard->MediaPress->Moderate menu as shown below. On the moderate page, you will see a lit of media and their current status. It lists all reported media. Some of the media which are reported may not be hidden. Media status is listed in the table. By clicking on the media, you will go to the page which lists all the reports for the given media. Hovering over the media will show you “View”, “Delete” and “Restore” context links. Clicking on View will take you to the front end single media page. When a media is held in moderation with hidden status, It is only visible to the site admin and the owner of the media. We also put an icon to let the site admin/owner of the media know that the media is hidden and is held in moderation. Previous:- Configuring MediaPress Media Moderator.